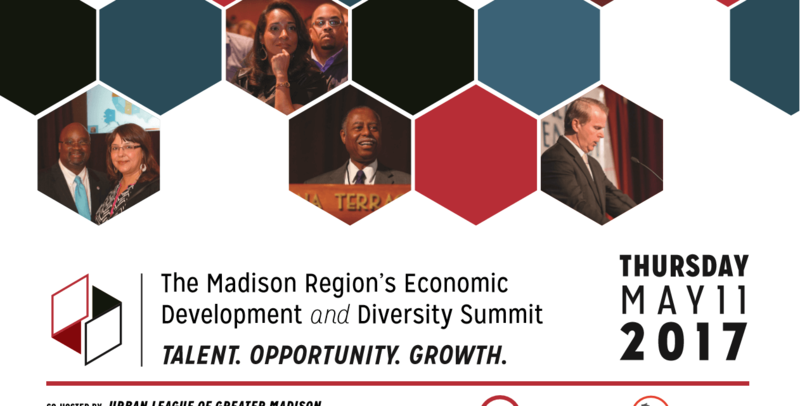 DETAILS: In their fourth year of continued partnership, the Madison Region Economic Partnership (MadREP) and the Urban League of Greater Madison (ULGM) are hosting a joint event for Madison Region business and community leaders focused on economic development and diversity. This annual Summit builds on the organizations’ previous joint events in a collective commitment to advancing talent, opportunity, and growth for all the region’s citizens. The day-long Summit will feature keynote speeches, breakout sessions, and networking opportunities for an anticipated audience of 450+ business and community leaders from across the eight-county Madison Region. Aggregate results of the third annual Madison Region Workplace Diversity & Inclusion Survey- a benchmarking tool capturing data about workforce demographics, supplier diversity programs, and community engagement – will also be shared. Featured speakers for the Summit include Tiffany Jana, CEO and President at TMI Consulting, a Diversity and Inclusion Firm; Dr. Steven Deller, Professor at UW-Madison Extension; Himar Hernandez, State Assistant Director for Community and Economic Development at Iowa State University; Dr. Chris Benner, the Dorothy E. Everett Chair in Global Information and Social Entrepreneurship, the Director of the Everett Program for Technology and Social Change, and a Professor of Environmental Studies and Sociology at the University of California, Santa Cruz; Dr. Alicia Robb, Founder and CEO of Next Wave, a Visiting Scholar with the University of California-Berkeley and the University of Colorado-Boulder; Deborah Biddle, Diversity & Inclusion Consultant and more. PRESS RSVP: Members of the press should email Katy Pettersen at kpettersen@madisonregion.org to confirm attendance. Visit madisonregionsummit.com for additional agenda information, including breakout session details.